This release contains a number of new features as well as improvements to existing ones. Income Tracker has been improved to add Time & Expenses transactions to the money bar. In addition, you have the option of excluding estimates, sales orders and time & expenses from the un-billed section of the money bar. Insights is a new dashboard that is added to the Home Page. This is a more up to date, cleaner and interactive feature than the older Company Snapshot. Send Portable Company File: This is a feature that lets you send a portable company file to someone (for example, exchanging this between the accounting professional and the user) in a simpler fashion than the way it used to be by streamlining the process. Reminders Window revamp: The Reminders window has undergone a visual update to make it easier to understand and work with. Lots of Little Changes: Many of these are based on user requests. Multi-User Admin: The Admin user now has the ability to end another user’s QuickBooks session even if they have unsaved data. Estimates are automatically closed when you fully invoice them. Registration Improvements: There are some minor improvements in the registration process, such as the ability to paste your license key into the window instead of typing it all in. There are a number of updates here, many based on user requests. Report Appearance Revamp: Intuit made reports easier to see while on the screen (this doesn’t affect printed reports). You’ll see background shading to highlight some lines, more vertical and horizontal lines, a bit more spacing between lines, and so forth. Comments on Reports: You can take a “snapshot” of any report, and then add annotations (comments) to any line. Send Multiple Reports: Now you can click an email button and send a group of reports all as attachments to one email message. Report filter names are sorted alphabetically, and are searchable. Filter Inactive/Active Names on Name-Based Reports: Reports where a customer or vendor name is the primary key, like a Customer Balance Detail report, now have a filter where you can select all active or inactive names. Adding Other 1 and Other 2 to Reports: Now you can add them to transaction detail reports, as well as filter records by their value. Preferred Delivery Method can be added to some reports. Preferred Vendor can be added as a column in some reports. Manufacturer’s Part Number on Sales Transactions: Now you can add the Manufacturer’s Part Number as a column in invoices, sales receipts and sales orders. Disallow Negative Quantities: A preference setting that will prevent you from using more inventory part or inventory assembly items than you have on hand. It is something you can turn on or off easily. Negative Item Listing is a new report that lists all items with a negative quantity on hand. Shortage Report for Manufacturing: If you want to build an assembly you must have the parts on hand. If you don’t, the new shortage report will show you exactly what you have on hand, how many the build needs, and give you a list of the shortages. You can also get this report to cover all “pending builds” that you have waiting for parts. Inventory Stock Status report upgrades: A new “full assemblies” checkbox that will make the report look at all levels of a multiple-level assembly. Also a filter to hide lines that have a “zero reorder quantity”. An improvement in Advanced Inventory if you are using both Multiple Locations and Lot Tracking that eliminates a previous error message when you are doing an inventory transfer. Restoring from a backup will restore inventory images to the right place. Total Columns on Forms: Another feature that people have been requesting for years. You can set your subtotal item to show a subtotal of the quantity, price, cost or any custom field, rather than just the amount. Sorting Columns on Forms: In sales forms, purchase orders, weekly timesheets, build assemblies, checks, credit card charges, bills and item receipts, you can simply click on a column heading and the detail lines will sort by that column. Footer on Last Page on Forms: If you have a sales or purchasing form that flows over to more than one page, why should you have the “total” box show in the footer of every page? 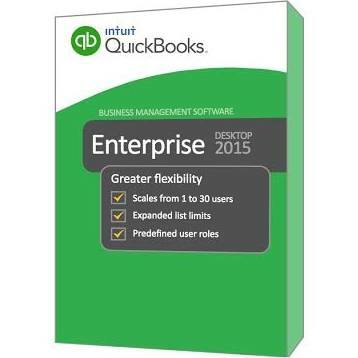 Now QuickBooks Enterprise has an option to Only show Total on the last page. Actually, more than just the “total”, pretty much all of the footer of the form. Search on Transactions: A new tab in transactions that lets you do a “search” within the transaction to find a specific value. Showing Cost on Sales Transactions: You can show “cost” on sales transactions. Row Shading on forms: You can specify that forms should print with alternating rows of shading. There is a preference setting to hide opening balances in the display for names and items. There is a preference setting to not allow sales to overdue customers. QuickBooks Enterprise Silver includes core product with the Advanced Reporting Module, Gold Edition will also add the Enhanced Payroll Module. The QuickBooks Enterprise Platinum Edition will additionally include the Advanced Inventory and the Advanced Pricing modules. These prices are only valid until October 31st 2014 and are subject to change without notice thereafter. To sign up or for any further questions, please feel free to call us at (855) 277-0700.